Treasure and India are from opposite sides of the tracks. Red-headed India lives in a luxury home with her mum, a famous fashion designer. Skinny beanpole Treasure lives on a council estate with her glamorous line-dancing Nan. When India and Treasure meet, they bond straight away. 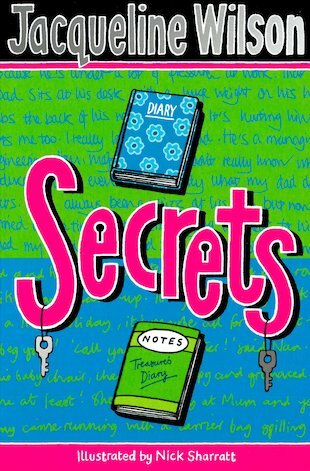 But Treasure has a horrible secret – her bullying stepdad is picking on her. And when his violence goes too far, she has to run away… Where can Treasure hide? India has an idea. She’s just read the diary of Anne Frank. Couldn’t Treasure take refuge in India’s attic, just like Anne Frank did? Told through the secret diary entries of both girls, this is a warm, inspiring tale of friendship in troubled times. 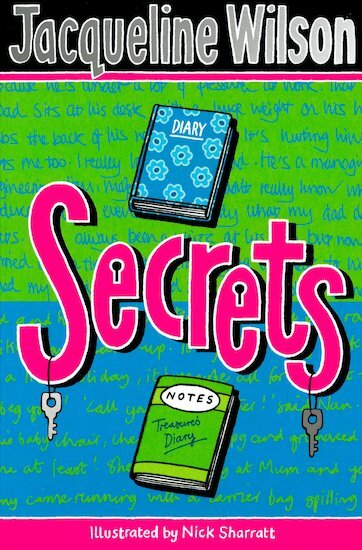 Jacqueline Wilson is a great author because she writes stories based on true situations as well as funny books,and Secrets is no difference!!!!! Recommend it for 9 years and up but if you’re a good reader then 8 years. I liked this book. At the start it is so emotional, but in the middle it gets better. I love this book sooo much. It’s exciting and I love the funny way India gives Treasure a pot to go toilet in like in Anne Frank’s diary! READ ANNE FRANK, THEN READ THIS OR YOU WONT UNDERSTAND! I really enjoyed this book! It was so emotional in some parts!